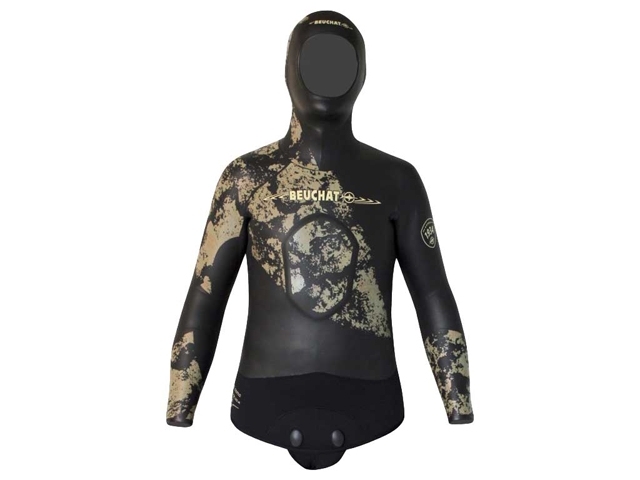 Spearfishing-Shop - Equipment for spearfishing and apnea - Jacket Beuchat Espadon Elite 8 mm. Jacket Beuchat Espadon Elite 8 mm. • It is produced with a warm and elastic single lined neoprene. • The jacket, features a chest pad reinforcement, and is available in thickness 8 mm. • The hood is equipped with a system to allow the trapped air to purge out of the top of the jacket. 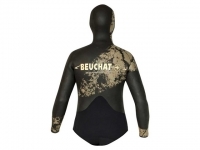 • Beuchat’s exclusive X-Ray Camo camouflage is based on the Beuchat Trigocamo photographic camouflage, specially redesigned for an ultra-smooth suit. • Natural monochrome colours melt into the underwater background. • X-Ray Camo camouflage is used on different parts of the Espadon Elite in order to break up the silhouette of the suit and make the diver even harder to detect. • Camouflage is positioned primarily on forward-facing surfaces. • Smooth outer coating improves movement through the water for slicker, more efficient diving. • Reinforced stress pad on the top specifically designed not to cause turbulence. This Product was added to our catalogue on Tuesday, 18. July 2017. Pants Beuchat Espadon Elite 5 mm. Main page » Catalogue » Wetsuits - Smooth » Jacket Beuchat Espadon Elite 8 mm.